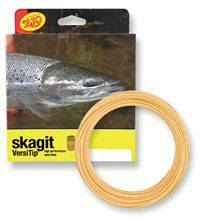 A great selection of top brand Floating Spey Lines and other floating salmon lines. 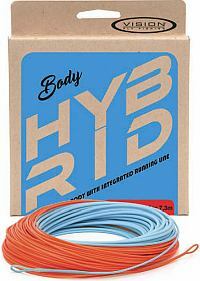 HYBRID FLY LINE is what you want it to be! It is a floating shooting head with an integrated running line. Vision give you the option to choose what you want from this line. All Hybrid tips work with all Hybrid, Hammer, TNT, ACE Skagit and ACE Switch shooting heads. When choosing the tip, you only choose the length you desire and density. You dont have to think about the weight of the tip as weve done that for you. Sinking Hybrid Tips utilise our Sliding Density concept where the density increases gradually to the tip of the line. Except clear intermediate which is a full intermediate tip. These heads will deliver long and heavy sink tips with large and heavy flies easier than anything. Hammer heads are sold as a belly only, without a tip. Tips are sold separately, and Hammer heads are compatible with our Hybrid and T-tips. All Hammer heads have ready made loops on both ends and weight & density print on the front loop. swing and easy to change fishing depth by changing the tip. gradually towards the tip of the head which is sink 3. 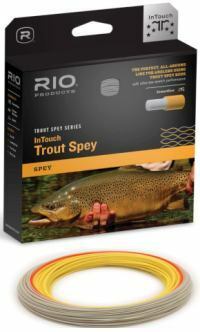 RIOs new UniSpey line is the ultimate all round, general purpose Spey line, and ideal for medium to larger sized rivers. More than two years of product testing and taper tweaking has resulted in an extraordinarily easy casting line, with a long front taper that produces ultra smooth, efficient loops. The line will easily cast larger flies and cope with tricky winds, yet lands with a great presentation that will not disturb glass-smooth pools. 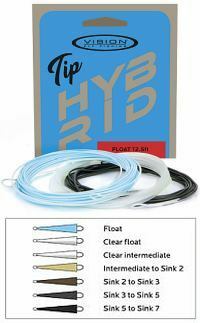 This full floating, integrated Spey line has a black loading point that easily shows anglers the best place to load the rod. CSF Salmon Spey - a 35yd (105ft) floating salmon spey line with a short 48ft head in peach colour. 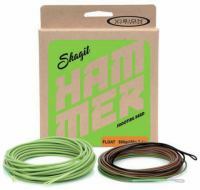 Great as a budget starter kit for the newcomer to salmon fishing or even for use as a saltwater line with the stronger core but short enough head for overhead casting. This line handles just about everything. The Snowbee Scandinavian-Spey Line has an integrated continuous Running Line and Backing. 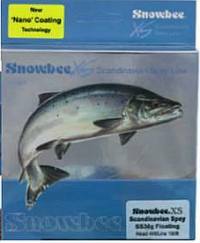 Snowbee's Spey line profiles meet the demands of salmon & sea-trout anglers, fishing with double handed rods in highly restricted areas, where the creation of a large D loop is near impossible. 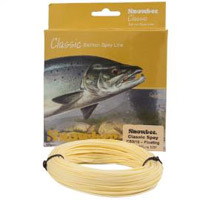 By combining the best of the Scandinavian underhand style of casting and shooting head line technology, with the UK style of Spey Casting and delicate front taper design, Snowbee have the ultimate fly line for tackling great places with tight spaces. The shorter heads on the Scandinavian Spey, load the rod quickly at short range, shoot like a dream and have the turnover of a traditional Spey line. 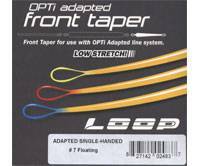 The fast front taper, is especially suited to fishing with Poly Coated Leaders, adding an extra dimension to fly presentation. WF spey line with 70' to 75' front head for spey casting in all conditions. A versatile line for two-handed rods that works well paired with new, shorter spey rods. Medium yellow head with light green running line. Line weights: 7-12; 120' length. Rio's Flight Shooting Head is the ultimate in short head spey lines, delivering maximum flight time, effortless casting strokes and the tightest and sweetest of loops. Based on the extraordinarily successful AFS head, the line features a heavy back end that loads rods deeply and easily and a subtle taper that ensures the energy flows smoothly to the tip, generating improved loops and long, long flight times and distance. The front end has a thick tip that packs a big punch and easily lifts out heavy tips and large flies with supreme ease. The heads vary in length a little depending on the size. 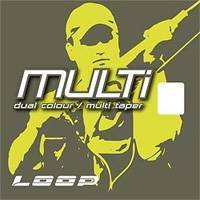 Attach a shooting line to the ultra strong welded loop at the back end and one of RIOs 15 ft tips or a piece of T-14 or T-17 (sold separately) to the exceptionally neat, bullet proof front loop.